After resuming the 9-5 working life, I hardly spent much time in taking care of my garden. 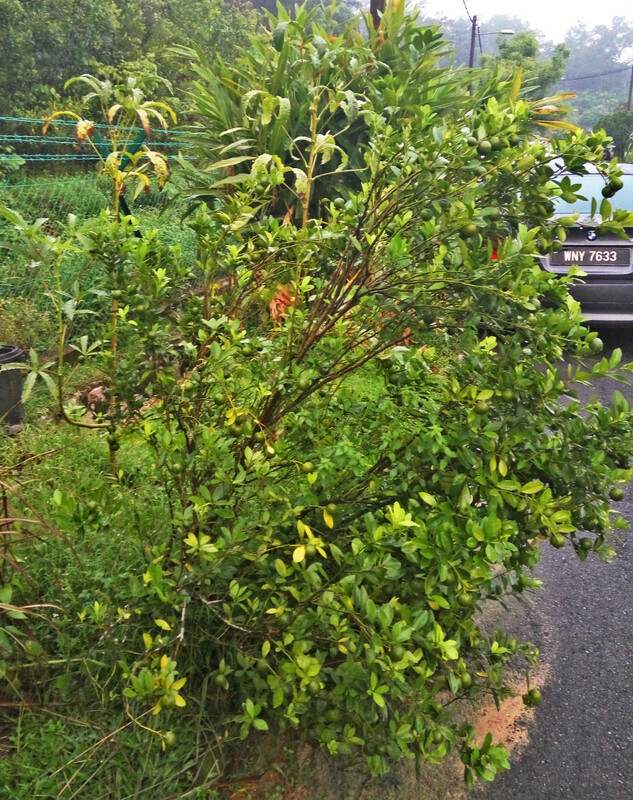 However, my 5 years old calamansi tree never seems to fail me by continuing fruit abundantly. 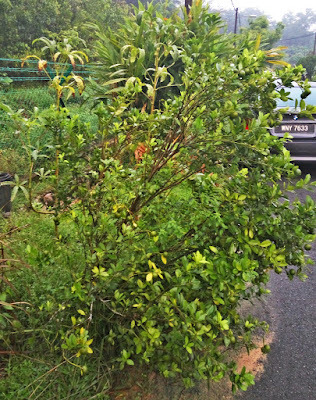 Calamansi is Limau Kasturi in Malay or 桔子in Chinese. We couldn’t seem to consume the fruits fast enough to cope with its ripening rate. 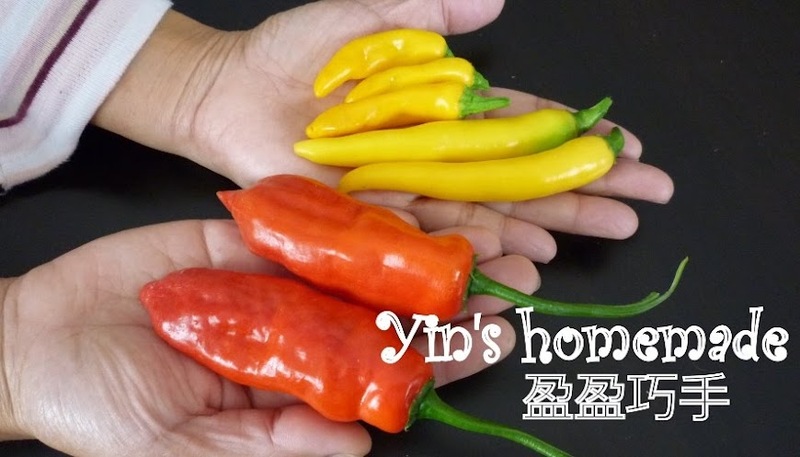 Rather than letting them simply rot and went to waste, I had to harvest them and shared with neighbours and friends. 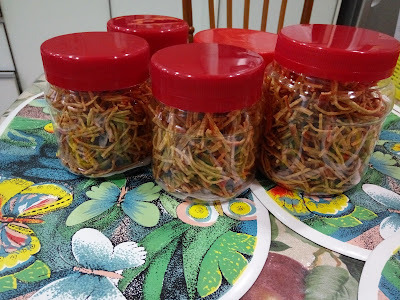 When I passed a bag of these little citrus fruits to my Sister-in-law who lives in Penang, she taught me a great way to preserve them into concentrated juice that can be kept in the fridge and can be easily consumed as and when we want. What I like most is, it is a very simple way to make. The recipe ratio for making this juice concentrate is 1:3, i.e. one part of juice and three parts of sugar. For my first attempt I used white sugar. In my 2nd batch I replaced white sugar with brown sugar instead as some claimed brown sugar is healthier than white sugar. 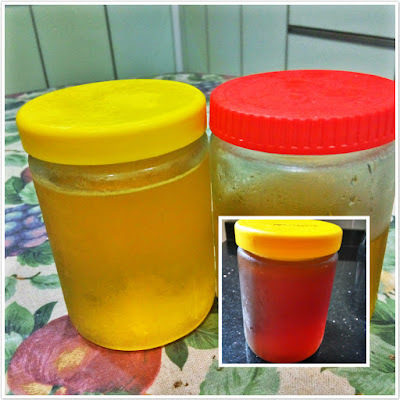 If brown sugar is used, the colour of the juice concentrate becomes darker and looks like honey instead of light golden colour as shown below. 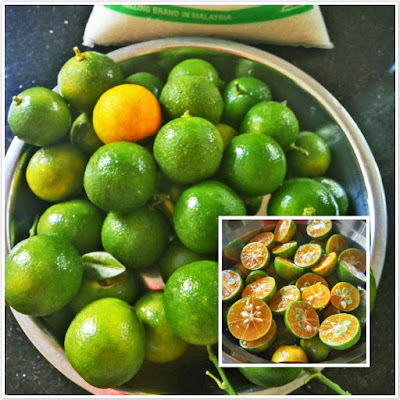 You can also check out my old post of Calamansi Sour Plum Juice, to learn how to make fresh Calamansi juice with Sour plum, another great thirst quenching beverage that you will yarn to have in the hot summer. 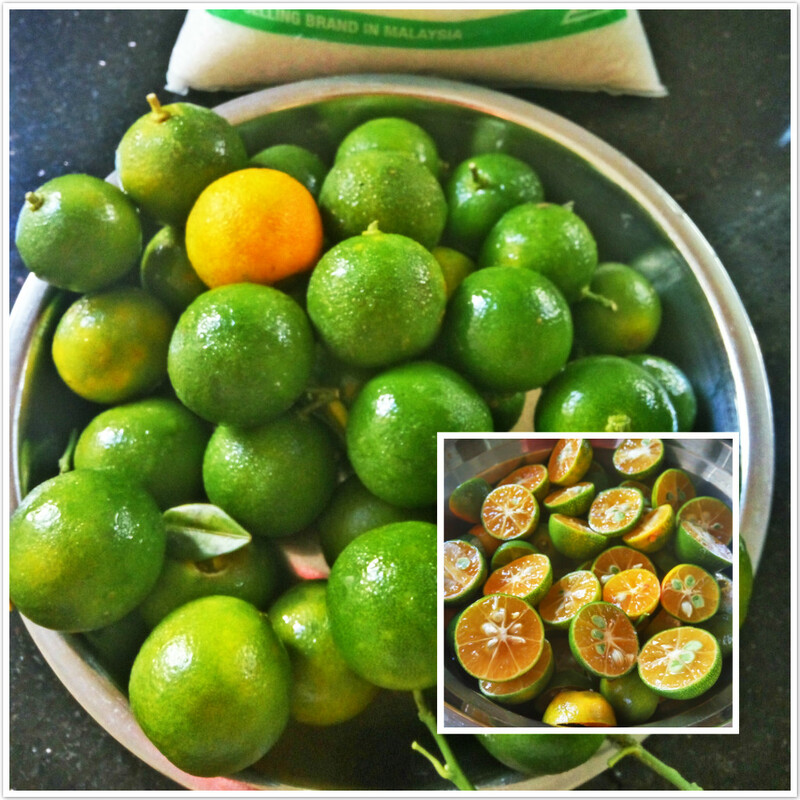 Calamansi is a member of the citrus fruits family. It is high in Ascorbic Acid or vitamin C content and best known for its healing effect to soothe the throat, a great natural cure for sore throat. 1. 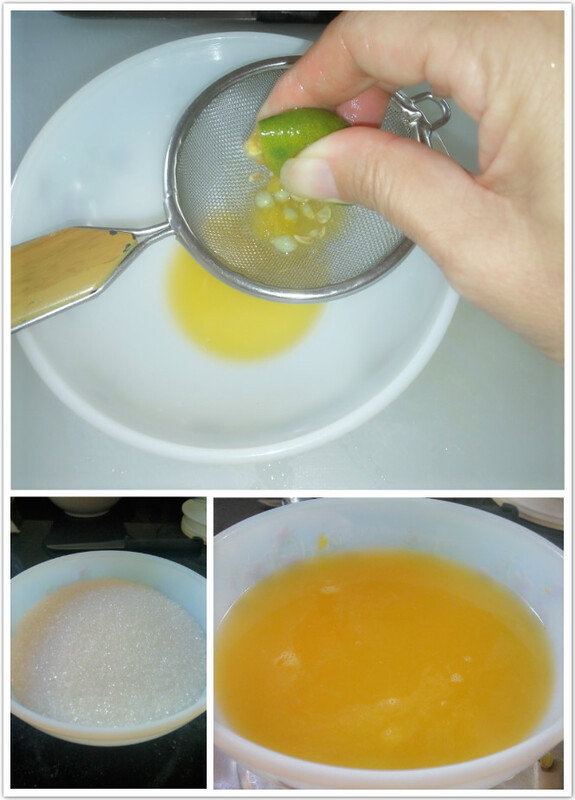 Wash lime, halve the lime, remove seeds and squeeze juice out into a bowl. 3. Pour juice into pot, add in sugar and stir well and cook in low medium heat. 4. Once the sugar fully melts into juice turn off heat and let it cool before bottle the juice and keep in fridge. Make sure no seed get into the juice else it made the juice turns bitter. It is customary during Chinese New Year to stock up cookies, titbits as finger foods to entertain relatives and friends who come visiting. It is so much fun munching snacks while chit chatting, as long as keeping our mouths busy 😁 . Months before this festive season, you will see various type of cookies and crispy snacks started to flood our local market and hypermarkets. Many are of these cookies are commercial made and some are homemade by housewives. This is also the best time for local housewives who are keen on bakery to earn some extra pocket money by selling their homemade cookies and snacks. 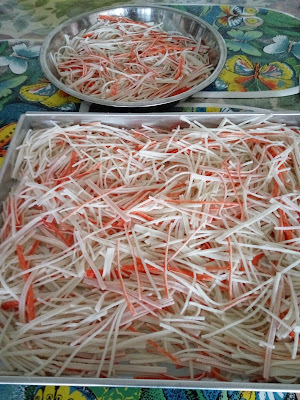 Among these snacks, Crispy Crab Sticks or Crispy Crab filaments is one of the most easiest snacks any of you even novice cook can try your hands on. 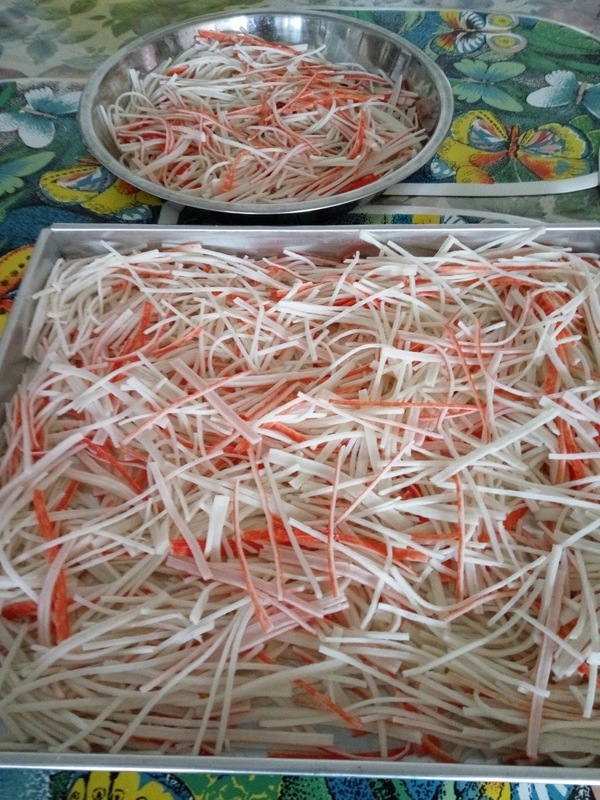 I had shared this recipe before, but now I found better way to improve the crunchiness of the texture of these crab sticks. 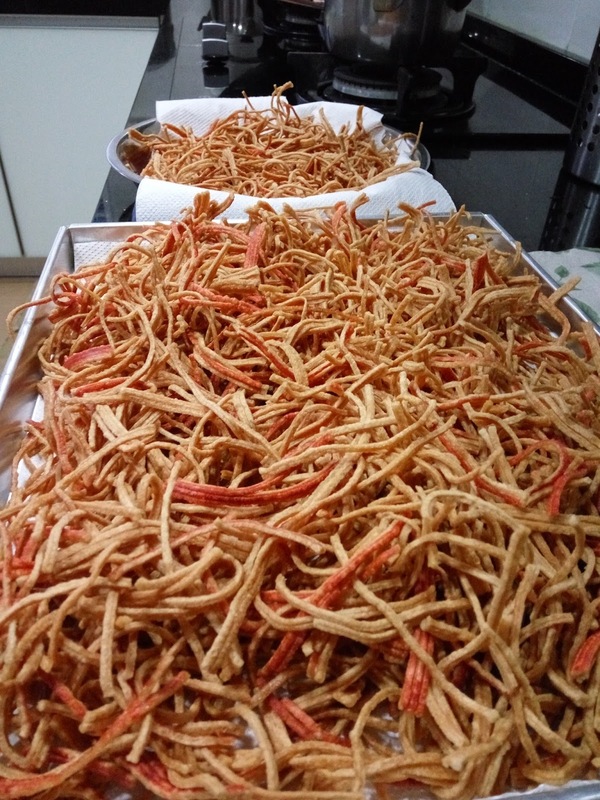 1) To buy the type of filaments which meant for deep fried. Try not to buy those use for steamboat. 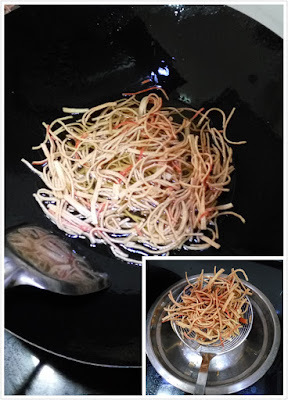 2) To sun bath these filaments to get rid of the moist in them before deep frying to ensure crispness. Once you have defrost the filaments, take off the plastic wraps and spread them on a big tray and just let them sit under the hot scotching sun as long as you can before deep frying them. I sun bath them for at least a whole afternoon before I deep fried them in the hot oil. 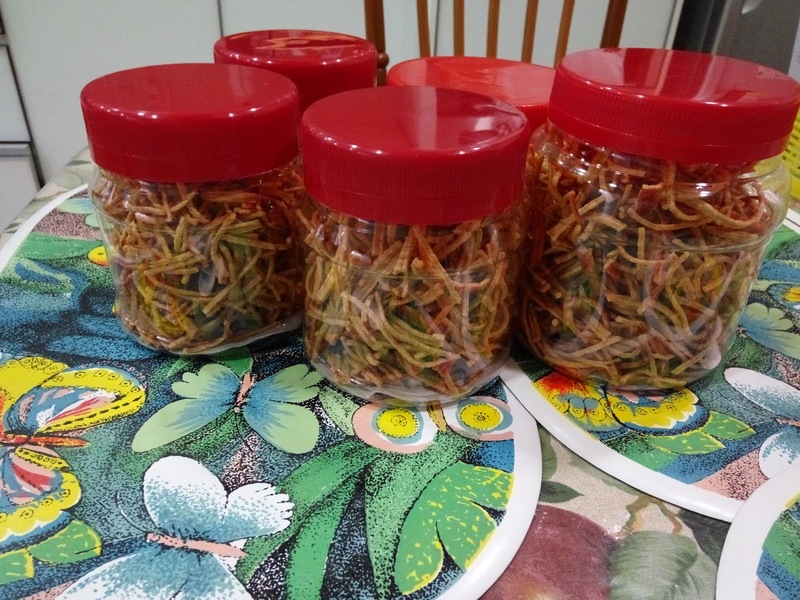 With a packet of RM15 Crab filaments, I managed to make 5 small containers of crispy crab sticks, which one container selling about RM13 market price. It is much economical and healthier to make your own. 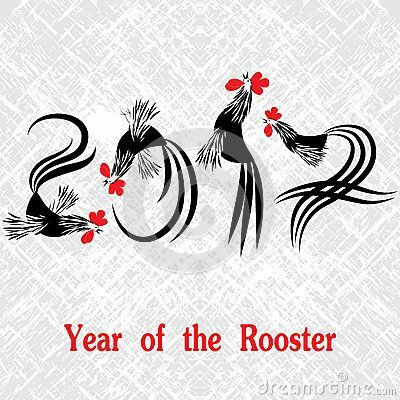 It has been a while since I last updated this blog, nevertheless I would like to take this opportunity to wish all the readers a Happy and Healthy Rooster Year ahead. Today is 15th day of the 8th month of the lunar calendar which is the full moon day for Chinese to celebrate Mid Autumn Festival aka Moon Cakes Festival. As usual I would to take this opportunity to wish all my families, relatives, friends and readers happy, joyful reunion with your love ones and stay healthy. This year, I tried out this simple traditional baked moon cake recipe which I have adopted from famous food blogger Christine's Recipes. Check out her detail steps by clicking this link. 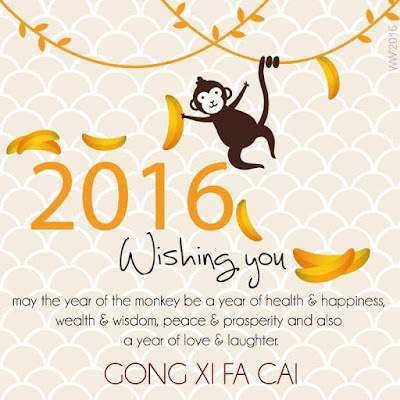 Time flies and in a split second we are now in 2016, the year of Monkey! Didn't we just have New Year Day yesterday? I haven’t seemed to have the free time as I thought I would have in blogging even though I quit my 9-5 office work since June 2015. 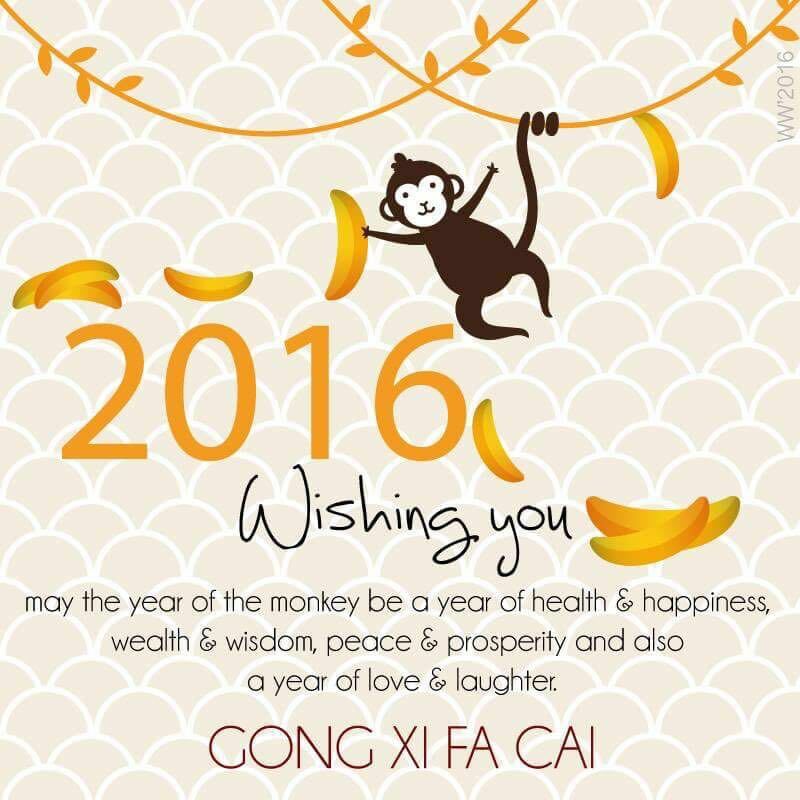 Well, this year I think I need to include blogging as one of my year 2016 resolutions, no more monkeying around! 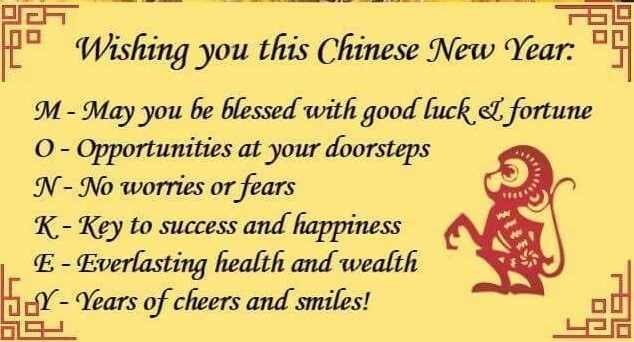 Today is day 2 of Chinese Monkey year. I would like to take this opportunity to wish all my friends, relatives and readers a prosperous and healthy Monkey year ahead. To celebrate Monkey year, let’s just bake something with his favourite food - Bananas. 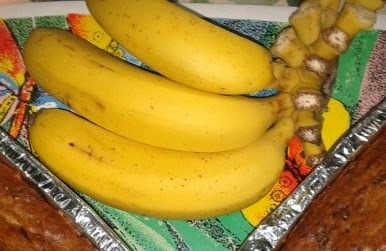 I have been trying out this banana cake recipe for a few times and very pleased with its taste and the simple method used. This recipe was adapted from Agnes Chang “ I can Bake” recipe book. 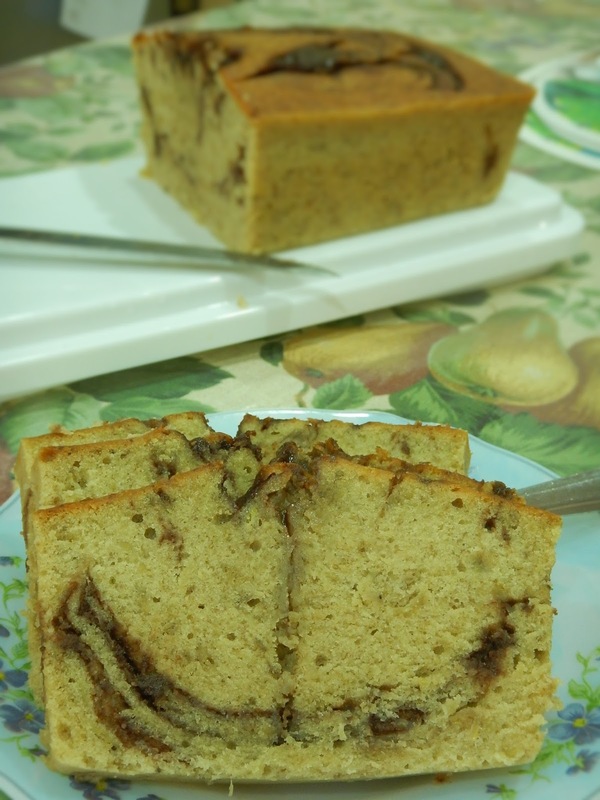 To have great flavored banana cake, it is best to use ripe bananas. Back in Malaysia, I find among local bananas Pisang Berangan a.k.a. Ang Bak chio, which means “red flesh” bananas in Hokkien with the size about 10 to 12cm long, is best for making cakes when it is fully ripe. Other than butter cake, this is another popular cake in our family that I used to make for festival and prayer ceremony to my late mother and parents-in-law. The following was the second version of Banana cake that I have attempted. 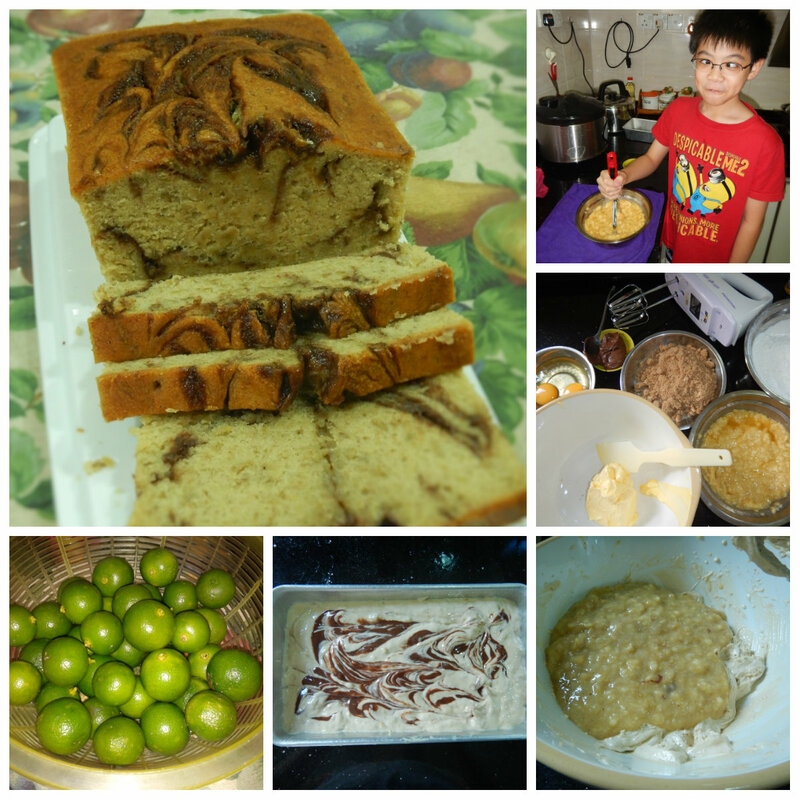 By adding few table spoons of chocolate hazelnut spread ( Nutella), it became a great Nutella marble banana cake. Good to have my mischievous helper to help me mashed the bananas. 4 ripe bananas, coarsely mashed and mixed with 1 tbsp of lime/lemon juice to prevent oxidation. 1. Preheat oven to 180°C for 15 minutes. 2. Lightly grease a loaf tin or line it with grease-proof paper. 3. Sieve flour and set aside. 4. Mix butter and sugar using low speed until well combined. Change to medium speed and beat until light and pale in yellow. (Note: Sugar has not dissolved yet). 5. Add in the first egg, beat well after each addition of egg until creamy. 7. Mix in the mashed bananas (add in bananas/vanilla essence and milk at this stage if you are using). Pour in the sifted dried ingredients and mix until well incorporated. 8. Pour the batter into the greased baking tin. Shake and tap on table lightly to distribute cake mixture evenly and to get the air out. 9. Place the cake at the middle rack in the oven. 10. Bake for 45 minutes or until golden brown and cooked. If a toothpick/skewer comes out clean, it is done. 11. Remove it from the oven and leave the cake in the tray to cool on the rack for 5 minutes before removing from tray. Notes: If the cake turns brown too quickly, cover it loosely with a piece of aluminum foil towards the last 15 minutes. I have attempted two cheesecake baking experiences in the past, using the recipes from well known cook books that I have. However, I was disappointed to note that both attempts were not successful. On both occasions, the cakes I made failed with poor cake appearances, either with cracked surface or sunk/collapsed center. Since then, I have given up cheesecake baking and only work on non-baked cheesecakes. Not until recently when I was back in Penang, my good buddy YL bought me a new cake mold that inspired me to give it another try. This time, knowing YL who was also a keen baker herself specializing in cheesecake baking; namely durian cheesecake, I sought her advice to learn her secret of success. She generously shared her customized recipe with me to give it another shot. So, this time guess how did it go? Even though with limited baking utensils and using a much smaller and unfamiliar oven in my sister-in-law’s ( SIL), LC’s kitchen…. Nonetheless, this was what came out from the oven…. Yes! I finally nailed it ! Hurray! I had a crack free and collapse free cheesecake! However, there was a minor flaw with the cake texture. It was slightly damp at one of the corners at the bottom of cake. This was because one of the corners of the mold was leaking and the aluminum foil I used was not double layered. I also didn’t firmly wrap the bottom of the baking mold. In the end, it resulted in some water sipping into the bottom layer of the cake and causing a damp corner. From the recipe, I noticed the difference of the recipe was the flour content. She used very little flour in her recipe. In addition, corn flour was added in it too! Chiffons method was used by whisking egg whites into soft peak then only mixed well with the cream cheese batter creating a light and fluffy effect. No wonder the cake was not dense and felt lighter. I made this cake on September 16th (916) Malaysia day. I was overwhelmed to see the cake come out perfectly. With my dad’s birthday falling on the same day, this cake was just nice to be used to celebrate his 85th birthday this year. Thank God my dad liked and enjoyed eating the cake very much. I was on cloud nine with his compliments on the taste and appearance of the cake being better than those commercially made cakes. His comments definitely made my day! Other than the cake, I also made my signature crispy roasted pork belly. With the help from my SIL, we successfully prepared a sumptuous home cooked birthday dinner for dad. It was a great dinner especially when you enjoyed it with your loved ones. 1. 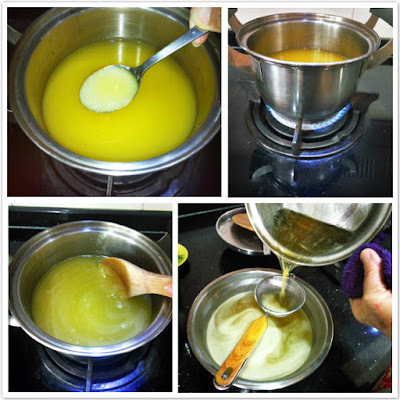 Melt cream cheese, butter and milk over a double boiler. 2. Cool the mixture and fold in egg yolks, flour, corn flour and mix well. Strain mixture to remove lumps. 3. Beat egg white until foamy, gradually add sugar and continue to whisk until stiff peaks. 4. Add egg white mixture and fold into the strained egg yolk and cream cheese mixture by 3 batches and mix well in one direction. 5.Bang the mixing bowl on top of worktop 3-4 times hard to reduce the air bubbles on the cake, before placing into oven and bake in a preheated oven ( 170 C) using water bath for 45 minutes at 160C. 6. When the cake is done ( test with a skewer when come out clean), switch off the power and leave cake in the oven for 10 minutes and thereafter leave the door ajar for 20 minutes. 7. Remove the cake from the oven and cool for 30 minutes before removing it from the pan and peeling off the baking paper. · To avoid cake shrinking quickly, leave it in the oven (while off) with the oven door ajar until cake cool down then remove. To avoid bottom of cake from becoming too dense, must fold the egg white evenly with cheese batter in one direction. To avoid cake browning too quickly, place tray at the bottom instead of in the middle rack of the oven. Lately, I was caught up with dad’s house renovation and I didn’t realize that Moon cake festival was just around the corner, which would fall on Sunday, 27th September. This was a very last minute project. Only yesterday, I found I still had some left over golden syrup which I made 2 years ago. The color of the syrup was getting darker and it might not be good for another year. Hence, I decided to clear it off to make a small batch of moon cakes. This recipe is unique compared to the traditional recipe. 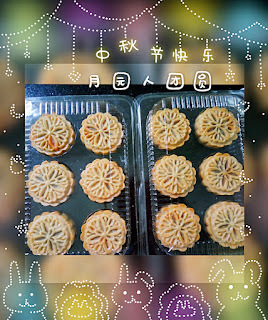 As opposed to usual filling such as lotus paste wrapped inside the moon cakes, the filling is combined with other ingredients to form the dough instead. After reading the recipe, in the same afternoon, I rushed to my nearby bakery store to shop for the necessary ingredients. I was in luck to get this very last plastic piggy mold in their store. 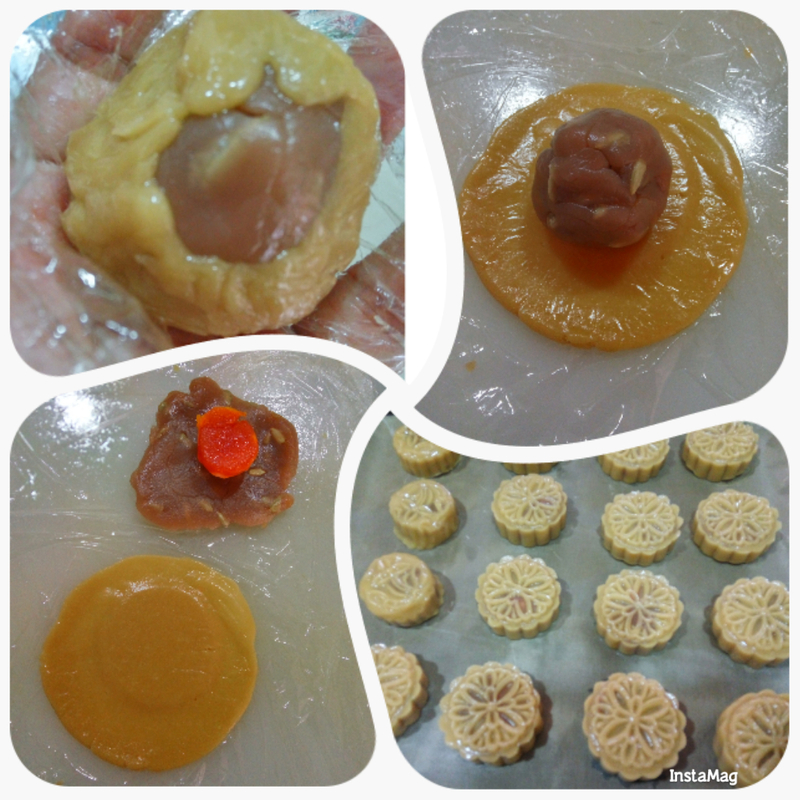 I also got a small pineapple mold which resembled a fish, just nice to be used for this moon cake cookies project. These piglets are so adorable, aren’t they? My piggy mold used around 55g of dough. The moon cake cookies with the shapes of “fish” ( 30g) and flower from the old moon cake mold I had previously. Freshly out from the oven. It would be nicer if I had black beans to be used as their eyes. I have yet to taste these cookies as they need to be left for at least a day for it to go thru the process of “oil return”( 回油）before it is good to consume. Traditional moon cake cookies may need to be left for at least 3 days to a week. Fingers crossed, it will taste good by tomorrow. Just wish to update on the texture of the moon cakes. The texture was slightly harder than I expected when consumed on the next day. However, after resting in tight container for a week, the mooncakes were coated with nice golden color and tasted so much softer. Hence, I would advice to follow the traditional "oil return" duration before consuming these moon cakes. 1. In a mixing bowl, add in syrup, oil, alkaline water and lotus seed paste. Stir mix until well combined. 2. Add in sieved flour and knead to form dough. Cover the dough with cling wrap and let it rest for at least 2 - 3 hours. 3. Divide the dough into portions that fit the mold that you are using. Roll each portion into a ball. Dust the moon cake mold with some flour. Press the dough into the mold. Tap to unmold. Arrange in a baking tray. 4. Preheat oven at 160 degrees Celsius. Bake the moon cakes in the middle rack for 10 minutes. Remove from oven and leave to cool for 15 minutes before brushing the top with egg wash. Return to oven for another 15-20 minutes of baking or until golden brown. 5. After the moon cakes are completely cooled down , keep in airtight container and consume the next day. Recently, I took a break from my career and went back to hometown, Penang to help my dad to renovate our old house while spending some quality family time with him. With the old house under full renovation and not in livable condition, we temporarily moved to stay with my second brother and his family. Other than an hour or two daily playing a Project Manager's role checking on the renovation status, I had a very relaxing schedule in Penang. With ample time to spare, I took over sister-in-law's kitchen to prepare dinner for the family to ease her busy working schedules. Frankly, I have not been cooking for a long long time. In fact, ever since we moved back from Auckland and with Auntie Lan back to live with us and taking over my kitchen, I have not been using the wok spatula for quite some time already. In the hope to prepare good meals for dad, I regained the passion to try out new dishes again. I found this simple and easy recipe via Facebook. Coca-Cola Chicken Wings (可乐鸡翅). Yes, no kidding, this recipe only uses the famous Coca-Cola soft drink and soya sauce as main ingredients with no water added in. I also wish to clarify that this is not a Western cuisine, even though Coca-Cola is originated from the USA, Coca-Cola Chicken is one of the famous Chinese dishes in Southern China. Well, this is another good example of the East meets West fusion. The use of Coca-Cola with high sugar content easily caramelized and tenderized the chicken, leaving a sweet, sticky and glazed appearance on the chicken wings. It might not be a top pick in a healthy menu list for dad but it was a sure winner for the kids and party menu. In fact, I must admit to a certain extent, it was tastier than the traditional soya sauce chicken. Clean wings, pat dry with kitchen towels and score them symmetrically on both sides set aside. Place the cleaned chicken wings into a basin, and add the marinade seasoning and half of the green onion sections and ginger slices. Mix well, and leave to marinate for half an hour. Heat wok with some cooking oil, brown the chicken wings for a minute, dish up and set a side. Pour out the excess cooking oil leaving just one tbsp. of cooking oil in the wok and sauté the left over sliced ginger, green onion and spices in the wok until fragrant. Add the browned chicken wings and stir well. Pour in 3/4 tin of Coke and 2 tbsp. of soya sauce and dark soya sauce and stir well. Cover it and simmer over medium heat for 25 minutes. When chicken is done and turned into caramel color and drying up, add a tbsp. of cooking wine and stir evenly. Turn off the heat, transfer chicken wings to a serving platter and serve.